A haunted account by Lt.-Gen. Dallaire, a former UN force commander, of the ethnic slaughter that ten years ago consumed a nation. Favoring the light-skinned, indigenous Tutsi people over the short, dark farmers of the Hutu nation, the Belgians who colonized Rwanda gave Tutsi leaders privileged positions in the government. Following independence, the Hutu rose up against the Tutsi, many of whom fled to neighboring countries and organized a rebel army. The back-and-forth killings eventually brought UN intervention, which did little to stem the bloodshed; in a period of only 100 days, some 800,000 Rwandans died. 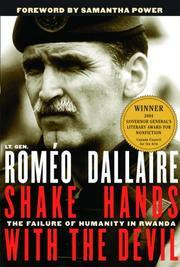 “Let there be no doubt,” writes Dallaire, “the Rwandan genocide was the ultimate responsibility of those Rwandans who planned, ordered, supervised and eventually conducted it.” But, he adds, responsibility also lies with the international community: the UN posted an inadequate force in Rwanda and failed to support the soldiers on the ground; France sent troops only to protect the Hutu génocidaires; the US, stung by the debacle in Somalia the year before, actively opposed intervention. Throughout, Dallaire is clearly anguished by his personal inability to stop the killing. In one affecting passage, he recounts fording a river choked with dead bodies: “ . . . my stomach heaved and I struggled for composure. I couldn’t bear the movement of the bridge, up and down on the slaughtered hundreds.” His guilt also centers on UN soldiers who died in the field, at least once as a result of “my poor operational decision.” In her introduction, Samantha Power (“A Problem from Hell”: America and the Age of Genocide) observes that Dallaire experienced post-traumatic stress disorder; coupled with his insistence on testifying against the killers at an international war-crimes tribunal, it led to his dismissal from the Canadian army.